But state Sen. Michael Williams, another GOP primary candidate, disagrees. So Williams saw Kemp’s pick-up truck—and raised him a bus. This is all taking place despite the fact that GOP-dominated Georgia already has laws on the books severely penalizing so-called “sanctuary cities” that have essentially eliminated in that state the sort of complaints traditionally made about American cities that “don’t cooperate” with federal immigration officials. Georgia is a state in which the “solutions” controversially proposed to this issue have already been implemented–but as you can see, the demagoguery against immigrants has only gotten worse. It’s just another example of the normalization of rhetoric only heard on the distant fringe of American politics before Donald Trump became President. In previous years, the absolutely horrific things coming out of these mainstream gubernatorial candidates’ mouths would be national news, with every Republican in the land forced to either validate or condemn it. In Donald Trump’s America, this barely registers. That could be even worse than what they’re saying. "A race that is setting new and unsettling precedent in its open appeals to racism"
Considering we are talking about GEORGIA – the state that gave us the Tallmadge family, Lester Maddox and the setting for the movie Deliverance – that is saying a great deal. Humorous news — apparently the bus broke down. 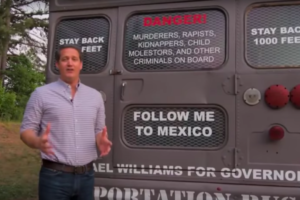 The Hill: "Gubernatorial candidate's 'deportation bus' breaks down during tour"